Oneida Research Services offers a number of residual gas analysis (RGA) testing services for use in Package Gas Analysis projects. The analysis and identification of gaseous components within a microelectronic package cavity using RGA testing equipment can be very useful when testing new product designs or performing quality control work on an existing product. ORS offers a number of residual gas analysis (RGA) testing services for use in Package Gas Analysis projects, in order to accurately test for these gases. Internal Vapor Analysis (IVA®) is used to quantitatively measure the primary and trace gases inside hermetic components. The gas content inside sealed components, particularly moisture concentration, can cause long-term reliability problems such as corrosion, fogging, leakage, current bit errors and lubrication issues. Known to some as Residual Gas Analysis (RGA) or Mil-Std 1018, Internal Vapor Analysis testing measures the primary sealing gases and trace gases inside a component. It is ideally suited for process development, sealing quality control, studying long-term outgassing of the enclosed materials inside the components, and for product qualification. High-Resolution IVA (HR-IVA®) services using our HR-IVA® Analyzer for testing cavity gases in very small volume packages. This new technology provides tremendous sensitivity to package volumes as small as 1 nanoliter compared to standard Quadrupole techniques which are applicable to samples larger than 0.01 cc. Materials Outgassing & Characterization Studies. Oneida’s outgassing services have been developed as a method to characterize the outgassing of a large variety of different samples. 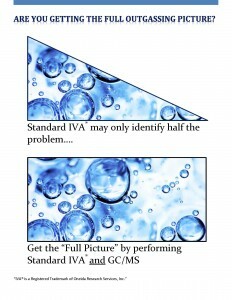 Testing may be performed via IVA® testing or GC/MS. Organic Mass Spectrometry. services at ORS provide method development and mass spectrometry testing services to a variety of industries. GC/MS analysis can be performed on a variety of sample matrices via Static Headspace, IVA® of hermetic devices, solvent extraction and direct injection, direct air injection, residual solvent analysis, gas cylinder analysis, and analysis of samples placed in ampules. Testing is qualitative, semi-quantitative, and can be customized to suit your RGA analysis needs. Gas Cylinder Analysis. Oneida Research Services can provide RGA gas analysis testing for representative samples of sealing and process gases. Monitoring the process stream gas and dry box atmosphere with advanced RGA equipment is essential for benchmarking initial sealing conditions.